If you’re looking at kitchen franchise opportunities, we think you should expand beyond kitchen-only brands and consider opening a DreamMaker® Bath and Kitchen franchise. There are a lot of similarities between remodeling a kitchen and remodeling a bathroom, so offering both services allows you and your team to apply the same skills while accessing a broader client base. And why DreamMaker? Our franchisees’ average unit volumes have increased 92% since 2011, according to our 2017 Franchise Disclosure Document, and we’ve been named to the Entrepreneur Franchise 500 for six years running. We have comprehensive training, award-winning franchisee satisfaction and systems that help franchise owners achieve higher margins on the projects they take on. The remodeling industry is growing strongly, topping $350 billion in 2016, according to Statista and the Home Improvement Research Institute. Both kitchen and bathroom remodels are among the most frequent projects, whether homeowners are looking to increase their home’s value, retrofit them for aging-in-place or simply get more enjoyment out of their most frequently used spaces. "Strengthening housing market conditions are encouraging owners to invest in more discretionary home improvements, such as kitchen and bath remodeling and room additions,” said Chris Herbert, managing director of the Harvard Joint Center for Housing Studies, in a segment for CNBC. But while the industry is growing, many remodelers still struggle to achieve the margins they need to run a profitable business. Strong margins allow owners to grow the business, expand their team and enjoy a higher quality of life. From our vendor relationships to our pricing estimation systems to our sales training, we help franchise owners put the pieces in place to charge an accurate and fair price while providing top-quality work at a great value for their clients. DreamMaker franchisees are a talented group who create award-winning kitchen remodels for their clients. 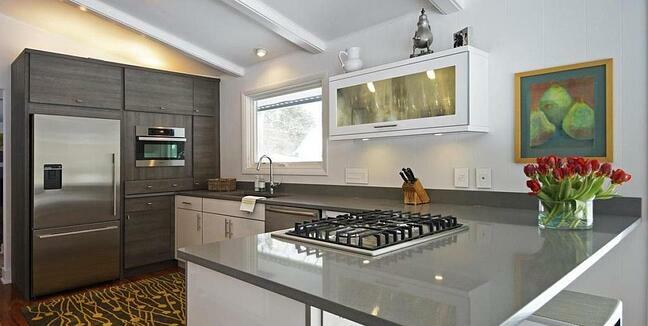 Quality is key for any kitchen remodeler. DreamMaker helps you access group buying discounts at top-quality vendors, and our processes help you complete projects more quickly and efficiently. That not only enables you to take on more jobs, it also greatly increases client satisfaction, leading to enthusiastic referrals and repeat business. But for remodelers who specialize solely in kitchens, it can be a little harder to take advantage of repeat business. If you do a great job, you’re likely to be at the top of the list the next time the kitchen needs a remodel – but that’s also likely to be many years away. There’s always word-of-mouth and referrals from satisfied customers, but even that’s more limited when your scope is limited, too. By expanding beyond the kitchen, you can take advantage of repeat business opportunities and be in a better position to take on referral projects, whether the prospective client needs a kitchen or a bath remodel. And of course, most homes have multiple bathrooms, meaning more frequent business opportunities. Between the large-scale kitchen projects and the multitude of bathroom remodels, DreamMaker franchise owners get the best of both worlds. Strong margins help make the growing kitchen remodeling industry even more enticing for DreamMaker franchise owners. DreamMaker franchisees can even go beyond just kitchens and baths, as some franchisees also offer remodeling services throughout the home. Our systems and support translate to those expanded projects, helping full-home remodelers enjoy the same advantages in project management and vendor relationships that they get in the bathroom and kitchen. For in-depth details about what makes DreamMaker one of the best kitchen franchise opportunities, download our franchise information report and start a conversation with us. You can also learn more by visiting our home improvement franchise research pages.